Have you been feeling a little weaker as you’ve gotten older? Or have you noticed that your physique might not be what it used to be? If you have, don’t worry; you’re definitely not alone. And although you’re probably reluctantly chalking it up to age, the truth is you don’t have to. By training your muscles regularly, you could rebuild the strength and musculature you had in your 40s—which is just a shade outside of your peak period for muscle maturity. 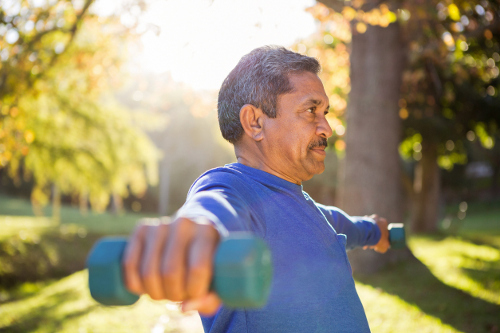 Studies have shown that men and women in their 60s and 70s who began supervised weight training were able to add the strength and musculature found in an average 40 year old—someone 20-40 years their junior. And it doesn’t take particularly long, either. You just have to stick to a plan. But that doesn’t mean things are going to work exactly the same as they used to. As you age, different things happen to your muscle fibers. Some of them die, and this is especially true if you haven’t been exercising. Sedentary adults—those who spend a lot of time watching TV, driving, or sitting at a desk—can lose up to 40% of their total muscle fibers by the time they turn 80! Other muscle fibers stay alive but can atrophy with age and inactivity. Those are the ones you can seek to activate, strengthen, and grow. And that’s really all that matters. You won’t be able to grow new muscle cells or fibers—a process known as hyperplasia (which may not be possible in anybody)—but you’ll be able to increase the size and strength of the muscle you already have. The way to do this is through regular and progressive weight training and a protein-rich diet. Progressive weight training means you continue to work with heavier weights as you go, causing muscles to fatigue. In order for your muscles to strengthen and grow, you have to work them to failure—meaning you couldn’t possible complete one more repetition of a movement without help. Studies have shown that weight training three times per week and working in rep ranges of eight to 12 per set is the best way to grow and strengthen muscles. Performing two to three sets per exercise, per muscle group, is the best way to do this. After the eight to 12 reps, take a rest for about a minute, then perform your next set. And remember: select a weight that causes you to fail between eight and 12 reps. If you’ve never worked out in a gym before you’re going to want to go in for an orientation and speak to a personal trainer who’s got experience with older adults. They can show you how to safely perform exercises and get on the right track. If you’ve exercised before and are confident with the movements and navigating the gym floor, I’d recommend a push/pull/legs split. On Monday, perform six upper body pushing exercises targeting the chest, shoulders, and triceps. On Wednesday, perform six upper body pulling exercises targeting the back, biceps, and trapezius. And on Friday, perform six leg exercises to target the quadriceps, hamstrings, and calves. Take rest days in between workouts and on the weekends! Bickel, C., “Exercise dosing to retain resistance training adaptations in young and older adults.” Med Sci Sports Exerc. 2011 Jul; 43(7):1177-87. doi: 10.1249/MSS.0b013e318207c15d. Reynolds, G., “Can You Regain Muscle Mass After Age 60?” The New York Times, December 2, 2016; https://well.blogs.nytimes.com/2016/12/02/can-you-regain-muscle-mass-after-age-60/?_r=0, last accessed April 25, 2017.